Residents of a neighborhood slated to be razed for an oceanfront redevelopment project in Long Branch get a chance to convince a judge their homes are not blighted under a ruling issued this morning by a state Appellate panel. The appeals court upheld a number of actions of the city, including its right to delegate its eminent domain authority to the developer, but said Long Branch failed to show the homes condemned for an oceanfront redevelopment project in the city were considered blighted. State laws that allow governments to take land for private redevelopment are being misused and need to be reformed to protect private property owners, the public advocate said in a report released Tuesday. In her cozy white clapboard bungalow three blocks from the ocean in Asbury Park, Angie Hampilos waits. And waits. 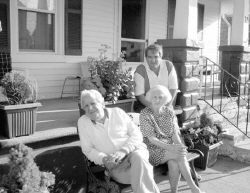 For 20 years now, Hampilos, 92, has lived under the specter of losing her home of 47 years to make way for the city's long-awaited oceanfront redevelopment. She can't sell it; she can't make any big improvements. She just watches it fall apart around her. No Chance of Kelo in N.J. So says the New Jersey League of Municipalities in their white paper entitled "Redevelopement - A Fundamental Right and Responsibility of Local Government. The block of 10th and Grand Street is one of the more quaint and unique areas in Hoboken. Its residents rave about its quiet, tree-lined, cobblestone charm and high property values. They believe that their block is hardly in need of redevelopment. But on Wednesday, the Hoboken City Council introduced legislation that would authorize condominium developer Ursa/Tarragon to "purchase or condemn" nearly half of a block to build 150 units of mostly market-rate residential housing. Adding to the controversy is that the land that they want to take is not rat-infested or abandoned property, but is the home of two businesses whose owners would like to stay open in their current location. Kwitman & Son, one of the last industrial businesses in Hoboken, has produced drapes and other home furnishings for the past 23 years. The company employs several dozen employees. The other business, U-Store-It, is a publicly traded company. Neighbors of the storage facility say the business provides an invaluable service for many Hoboken residents whose apartments don't have enough closet space. Over the past decade, politicians and city planners in Hoboken have used redevelopment law to develop large portions of the city. Redevelopment, according to state law, is a zoning term that means there is an area within the municipality that is not being used to its full potential. Designating a redevelopment site can mean special zoning. It can also mean allowing the developer to get tax abatements or make special in-lieu-of-tax payments. Redevelopment also means the governing body can pool a large area of property together, even if the land is owned by multiple owners, and then zone the property as they wish. Back in 1998, Hoboken's west side was blighted, with only a smattering of timeworn warehouses and trucking companies. Under the administration of former Mayor Anthony Russo, the City Council created the "Northwest Redevelopment Area" and adopted a plan for the over 20-block area to stimulate growth. Now many blocks have new condo projects. The western side of the block of 10th and Grand streets is the far eastern edge of that redevelopment zone. URSA/Tarragon was designated as the developer for this portion of the Northwest Redevelopment area in 2001, according to city officials. At Wednesday night's City Council meeting, the governing body introduced an ordinance that would allow the developer to "purchase or condemn" the property where the U-Store-It and Kwitman & Son are located. Essentially, it would give the developer the ability to use eminent domain to seize the property to build 150 units of housing. The U.S. Constitution's Fifth Amendment currently allows the government to force a private person or business to sell their land so it can be put to "public use." Under this government power, known as eminent domain, property owners must be given "just compensation." The U.S. Supreme Court originally, in the 1950s, ruled that private property could be seized in blighted neighborhoods or communities. The government generally used the power in order to eliminate slums or to build highways, schools, airports or other public works. Since then, lower courts lessened the burden for the definition of "public use" and have ruled that the mere opportunity to create jobs or generate tax revenue is enough to apply it. In recent years, cities have become more ambitious and aggressive, creating "redevelopment areas" where land has been taken for parking lots, big box department stores, casinos, residential housing and other revenue-generating businesses. At Wednesday's City Council meeting, a number of neighborhood residents said that they oppose the city's plan to seize property currently in use by a private business only to use it for residential, market-rate housing. The neighbors also said that the project would have a negative impact on the local traffic patterns, and would make the city's parking problems even worse. While the Northwest Redevelopment plan was successful in spurring development on the city's west side in 1998, conditions have changed and that original plan should be reevaluated, the neighbors said. "I think that a decade is a long time to keep a plan in place," Grand Street resident Sandy Azzollini said. "Every plan should be flexible. The [project] would drastically change the face of the neighborhood." She added that both of the businesses are "quiet and good neighbors" and that many residents take advantage of the storage units. Grand Street resident Maxie Plant added that it's hardly a "public use" to put "two exceptionally viable businesses" out of business and replace them with a "massive complex" that is out of scale with the rest of the block. Grand Street resident Ann Graham implored the City Council to amend its redevelopment plan. "You are the redevelopment authority of this city and you can change this," she said. "You have to realize that the neighborhood does not want this. You can say that this is no longer a viable redevelopment area." Hoboken resident Jim Vance spoke out against the practice of taking private property and using it for a private use. "Who is to say that my home isn't next?" he asked. Vance added that he found it interesting that Ursa and Tarragon were two of the biggest contributors to Mayor David Roberts re-election campaign last year, and now the city is considering giving them the power of eminent domain to build what promises to be very profitable project. Councilman Michael Cricco, who is the councilman for the area, said that while it might not be 1998 anymore, the Northwest Redevelopment plan has been a tremendous success. He added that Hoboken has reaped great rewards from the plan over the past eight years, and that the west side would still be full of blighted and empty lots without it. He said that the original plan should be seen to completion. He also said that Ursa/Tarragon is offering substantial givebacks to the city. He said that they are building 200 affordable housing units in the area, donating lights to the city's little league field, paying for winter skating rinks, and cleaning up severely contaminated properties in Hoboken. They are also building a multi-million dollar community center and pool, which is already under construction. "It's now time to pay the band," Cricco said. Community activists have countered that this property is only a small percentage of the Northwest Redevelopment Area. They also argue that on Tarragon's very own Web site, the company has boasted about how the Northwest Redevelopment projects are some of their most profitable. According to the activists, URSA/Tarragon would hardly be precluded from making a profit on the area if the city were to amend the redevelopment plan to exclude these two buildings. But Council President Christopher Campos said that it's not that simple to change the plan. He said that the 1998 Redevelopment Plan and the 2001 developer's agreement constitute a legal contract. "We, as a city, have a contractual and moral obligation to continue with the use of a redevelopment zone," he said. But Councilman Peter Cammarano observed that no matter how the City Council votes, they are likely looking at a lawsuit. He said that Ursa/Tarragon has already filed a lawsuit against the city and the City Council to compel them to live up to their developer's agreement. But if the council authorizes the use of eminent domain, they are looking at lawsuit from the property owners. The owners could argue in court that 150 units of residential development in a neighborhood that already has million-dollar property values might not qualify as a "public use." "I think we might be in for a bruising," Cammarano said. "I'm not convinced that we are taking it for a public use."